Brodeur Bros. Boat Builders was a small family firm located on the shores of Georgian Bay in Waubaushene. It operated from 1932 to 1947. 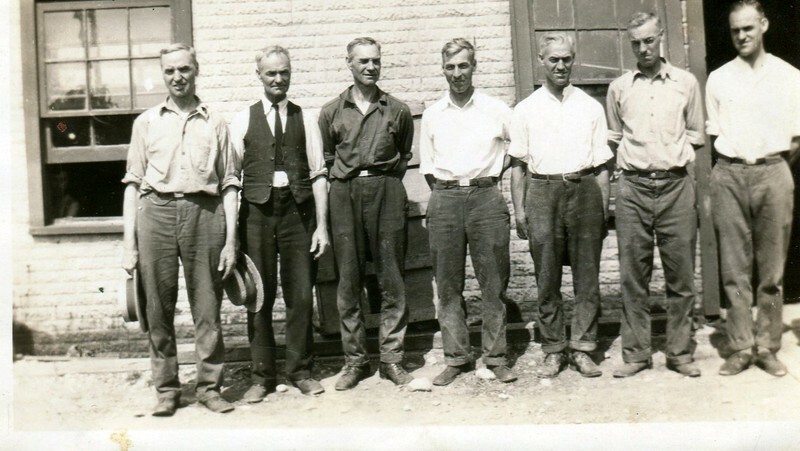 The founders and operators of the business were seven of the Brodeur brothers: (From Left to Right) Walter, Albert, Edmund, William, Patrick, Sam and Steven. (William, centre, was the grandfather of the writer). Two other brothers and two sisters were not active in the business. The Brodeurs were representative of many Quebec families who moved to Ontario to follow the lumber industry. No doubt Jeremiah must have passed on to his sons some important woodworking skills. As self-taught craftsmen they built the Brodeur homes on Cherry Street which are still standing today. Their boat works consisted of a simple tarpaper and wooden frame building with a single boat slip. They generally built one or two boats at a time in their small shop. In later years they were located on Coldwater Road near Duck Bay road and the old Waubaushene bridge. Prior to 1937 they operated from a site off Balsam Street at the entrance to Matchedash Bay. The brothers apparently had no interest in growing the business. No one brother was in charge of the operation; they equally shared the responsibilities of running the business. They built to customer order and their sales were based upon word of mouth and reputation. In their heyday they built up to ten boats per year, ranging in size from canoes and rowboats to cruisers and open launches. They also did repairs to other craft. Their wooden cruisers and launches featured solid oak frames and classic lines, with gleaming mahogany interior and exterior finishes. Their boats were very fast, powered by gasoline engines such as the Buchanan Comet. When business was slow the Brothers also worked for Ditchburn Boats Ltd. of Gravenhurst. The boats were often ordered by wealthy people from the Toronto area. 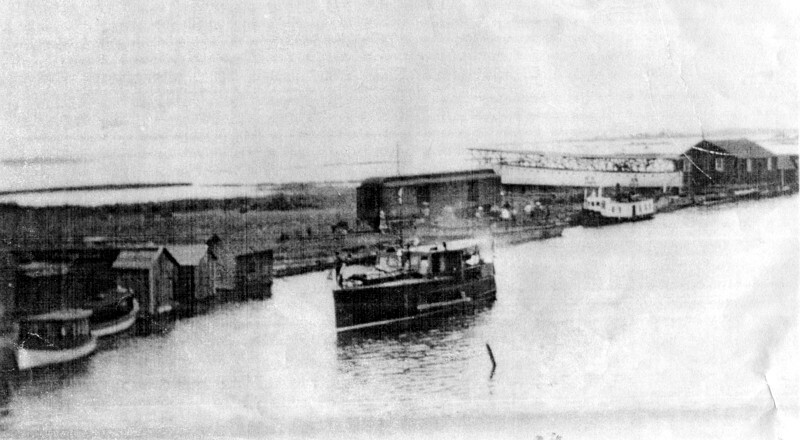 The firm had a lot of competition such as Ditchburn Boats and Grew Boats in Penetanguishene. The firm built a 50’ sedan launch for Loblaw’s called the “Movedalfen” which supplied groceries to cottages in Muskoka during the summer months. Although the brothers never had their own large boat, they would use the “Movedalfen” occasionally for family picnics. Their biggest job was the construction in the early 1930’s of an eighty foot steel and wood yacht (“Kenosha”) built for C H (Charles) Sheppard who had bought the Georgian Bay Lumber Company headquartered in Waubaushene. Charlie Sheppard also bought the 130’ ”Ambler”, which featured twin diesel engines and had a six-man crew. He gave the Ambler to the Canadian Navy to help in the World War II effort. The Brodeurs built four different boats for the Sheppard family, the last a beautiful mahogany cruiser with a cockpit and large seating area. In the winter or 1939-1940 the Brothers built the gas boat “Julie F”. For 32 years Norm Brodeur and other family members would deliver gasoline and fuel to cottagers and businesses on the Georgian Bay shore and on the Severn River. During WWII the company had a government contract to build 25-32 foot diesel motor cutters for the Ministry of War. It ceased operations in 1947, unable to compete with mass production techniques. 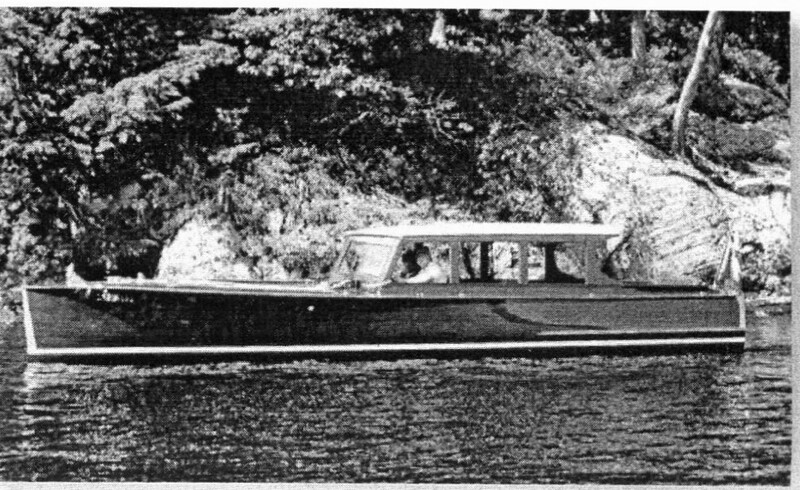 Victor G. Brodeur, Brodeur Bros. Boat Builders, ClassicBoat Magazine, Fall 2008. Much of the information in this posting is derived from this article. This entry was posted in heritage, history, industrial, logging and lumbering, Uncategorized, Waubaushene, World War Two and tagged Canada, Georgian Bay, Great Lakes, local history, Matchedash Bay, Ontario, Simcoe County, Tay Township, Waubaushene. Bookmark the permalink. According to the “Brodeur Book, all Brodeurs are related going back to 1653 with the immigration from France of Jean Brodeur and wife Marie Messier. There are now more than 30,000 Brodeurs in N. America. Most are in Quebec, but a lot came to Ontario, Maritimes and a lot went to Louisiana, USA. I have a copy of this book. It was finally released in 1981 after a lot of research and 11 years in the making. It was written by Clement Brodeur. (9th generation). Like you, my mother also is a Brodeur. There you go, cousin. The Brodeur Bros. are my mothers uncles. (My great uncles). My grandfather Earnie was their brother, he passed in the 1920’s, before this photo was taken. There was no president or decision maker—-everything they built was by mass agreement. Wish we could work like that today. When I knew them all as a child in the 40’s and 50’s, they were all retired. Thanks for your story. Interesting about the decisionmaking process. The 7 Brodeur Bros. in the photo all got along very well with their work ethics as there was no leader among them. There were 2 more brothers, one was my grandfather who passed very young. There were also 2 sisters making a total of 11. The all lived in Waub at one time or another—most of them, their whole lives. Thanks for the added information. Eleven kids, imagine mealtime chaos, noise, and energy. Must have been epic. Albert Brodeur was my great grandfather, Lillian his oldest daughter was my Grandmother. Many evenings at the cottage Yokumvilla in Honey Harbour were spent listening to my father Doug Wilson, Uncle Norm original owner of the “Julie “F” and the rest of the Brodeur clan speaking of the days when the seven brothers were building their boats. Christine Brodeur obviously got her musical talent from the Brodeur brothers. Good to hear from you Robert. Some of our Brodeur family are still in town and your grandparents’ house is still standing. Yes, I know the house is still standing, although, it looks quite a bit different from when I lived there as a child. Your cousins, Barry and Carol also lived there for a while. Many great memories from that home from all the generations. Tons of stories as well. I am an artist, and my main work is painting people’s homes. I have done 7 or 8 paintings of the home for family members. (As we remember it). Thank you for posting this article. My grandmother was Olive Brodeur, she died when we were quite young and so we don’t know much about this side of the family. Her father, my great grandfather was William Brodeur, which I suppose makes you and I cousins! Are there still Brodeurs living in Waubaushene? I’ll be making my first visit there on Sunday. Olive was my mother’s sister, therefore my aunt. My mother’s maiden name was Hilda Brodeur, daughter of William, therefore my grandfather. I assume that your father was Bob Gould. You do have other cousins in Waubaushene, including Christine Brodeur and Sid Gould. In fact we all live in sight of each other! If you get to town, you’re welcome to call. Hi , I’m William Paul Morreau, my mother married Clement F. Morreau, her name was Margaret V. Bonneville her sister was Elizebeth and she was married to Sam Brodeur Sr. He was a very fine gentilman and they were a wonderful family. The Bonneville family lived in Port Severn. We visited the Wab. Area almost every summer and stayed at Aunt Lizzy’s house most of the time. We also spent many Christmas times there. Sam Jr. Was also a great guy. I still have an old life ring he gave me from the old boat factory and a bronze plaque that they used to place on their vessels. My heart still is filled with these memories of that time in my life. If you ever decide to have a family reunion I would like just to meet and enjoy the visit. Thanks. Bill Morreau 21814 Knudsen Drive Grosse Ile Michigan. 48138 or call 1 734 676 7982 or 2bmor@sbcglobal.net. P.S. I also am an Artest and most of what I paint are ships and boats so if any one has pictures of some of the Boats that were made by the brothers I would be glad if you could forward them to me, thanks. Bill. Hi all, my Uncle was Steve Brodeur who married my Aunt Grace Robinson in middle age. I treasure a model boat that my Uncle built while nursing his sick father, the other brothers were built the full-size version at the same time. They drew straws to determine who would be the nurse. I was told that he entered the model in the Toronto Exhibition and won second prize. I can provide a picture of the model boat ” Commander of Waubashene” if anyone has an interest. I knew Steve and Grace. In fact they were my mother’s aunt and uncle. I’d be most interested in your picture. My grandfather was James Brodeur, one of the nine brothers. My father was Louis Brodeur. My dad always talked about his father James being a boat builder. James died in early 1946 but I believe that he was also with the other 7 brothers above in the boat building. Can anyone confirm this?